The scanner is used, but it great condition. It has been tested and works properly. An easy to use scanner/receiver from TTI designed to appeal to air band enthusiasts and other HAM radio hobbyists. The box includes scanner, antenna, belt clip, SMA to BNC adaptor, 3 x AA 1.2V - 1700mAH batteries, 9V - 500mAH AC adapator with 3 Pin UK plug and instructions manual. YUPITERU MVT-7200 the Most Sensotive Scanner. Narrow Am & Ssb Filters. Condition is Used. Narrower maruata ssb filters. Superb ssb reception. Am narrow filter. If you want the best sensitivity and selectivity on am civil airband ever in a scanner this is it. The antenna is a "receive only" device and does not require any batteries for operation. 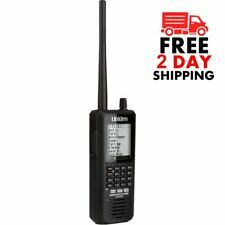 any other wideband handheld that receives HF / VHF signals. customizable frequency (larger loop or more loop turns lowers the frequency range & better reception on those signals). 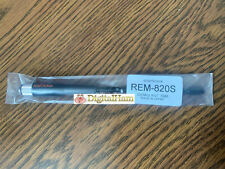 RADIO SHACK PRO-94 20-524 Dual Trunking 1000 Channel Handheld Scanning Receiver. Condition is Used. Shipped with USPS Priority Mail. The protective plastic is still attached to the screen. It has been tested and works properly.The antenna, USB cord, carrying strap, and manual are included.The manual is in rough shape and the antenna is not OEM. Uniden BC75xlt Bearcat 300 Channel Portable Scanner Barely used excellent . Condition is Used. Shipped with USPS Priority Mail. UNIDEN BC796D. P25 APCO CARD INSTALLED. AUTO Keypad Lock, Dual Band, Dual Display and Dual Standby. Consumption in Standby: 380mA. Duty cycle: 03/03/54 min (Rx/Tx Standby). Antenna Impedance: 50 Ohm. High / Low Power Settings (4W/1W) Programmable Amateur Radio Frequency Range: 65-108 MHz VHF: 136-174 MHz(Rx/Tx). 200 programmable channels with duplicate frequency check. Original antenna and it's in good condition. Code signal papers do show minor storage wear. I am not an expert on anything, just a collector of much. Model: SDS200. The SDS200’s other major features includes DMR Tier III . Single-Channel DMR . Paid upgrades required for DMR, NXDN, and ProVoice monitoring. APCO P25 Phase I and II. Backlit Keypad. APCO 25 Phase I and Phase II. Backlit Keypad & LCD. Simple-to-use Sentinel PC Software keep your scanner's database and firmware up to date. Fire Tone-Out Alert. 8-Hours Operation on 3xAA Batteries. USA/Canada Radio Database. Features: Memory Storage/Programming 10 Channel Storage Banks - You can store up to 50 frequencies into each bank for a total of 500 frequencies so you can more easily identify calls. PC Programming - you can download information into the scanner and control the scanner via your personal computer. CTCSS and DCS Squelch Modes - rapid search for CTCSS/DCS tones/codes used during a transmission. You can identify up to 50 CTCSS tones and 104 DCS codes. Direct Access - lets you directly access any channel. Manuals can be freely downloaded from the Uniden website if needed. The antenna is a "receive only" device and uses an A23 battery to amplify the signal for best reception. The benefit of the loop design is that it is less susceptible to household RF noise over traditional whip antennas. AOR AR8200. Alinco DJX-2000. Reception on the amateur bands with this antenna is much better and you can typically copy many more signals that would otherwise be unavailable using the antenna supplied by the radio's manufacturer. Includes Both Civil & Military Aircraft Bands! 10 Banks, Optional PC Programming w/ Included USB Cable & Free Software Available OnLine! In used condition, see photos. Neues AngebotUniden BCT15X-BearTracker Scanner With 9,000 Channels BRAND NEW !!!! BCT15X Scanner. I will get back to you as soon as possible. Public Safety Scanner. 9000 Dynamically Allocated Channels - Plenty of room for all your local systems. Temporary Lockout - Lets you temporarily lockout noisy channels. QTY 2 BCT125AT scanners with this purchase! Features: Memory Storage/Programming 10 Channel Storage Banks - You can store up to 50 frequencies into each bank for a total of 500 frequencies so you can more easily identify calls. PC Programming - you can download information into the scanner and control the scanner via your personal computer. CTCSS and DCS Squelch Modes - rapid search for CTCSS/DCS tones/codes used during a transmission. You can identify up to 50 CTCSS tones and 104 DCS codes. Condition is Used, Tested and Works. Public Safety Scanner. 9000 Dynamically Allocated Channels. 9000 Dynamically Allocated Channels - Plenty of room for all your local systems. 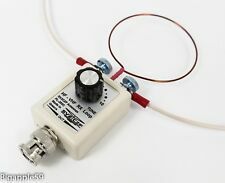 Temporary Lockout - Lets you temporarily lockout noisy channels. Close Call RF capture technology instantly tunes to signals from nearby transmitters and the Do Not Disturb Mode prevents Close Call checks during a transmission. With this Bearcat scanner, you can listen to military and civilian air bands. Features: Digital triple trunking handheld scanner Intuitive "Object-Oriented" user interface design Menu-driven programming with context sensitive help Flexible free-form memory organization V-Scanner technology Multisystem trunking Remote control capability P25 Network Access Code (NAC) is used to provide selective squelch operation on conventional dig High-speed PC interface Powerful spectrum sweeper Real-time signal strength indicator Bands Received 29–54 MHzVHF Lo108–136. Model BCD436HP. Never even took the plastic off the face. Thus is almost new and sold as is. This scanner is in great used condition. It includes the AC power adapter as pictured. Does not include any other accessories. One of our most popular radios, the 15X is a great (non-digital) trunking scanner that can be used as a base or mobile. Includes loads of terrific features (details below) including unique GPS operation. Contains pre-programmed Highway Patrol frequencies and trunking for non-digital systems. Order the scanner alone or build your own package with discounted accessories and HomeTown Programming. W/Box & Owners Manual. Turns on and searches all 20 channels. Item is in excellent working condition and with minor to moderate wear. See photos for condition. You will receive the item shown. 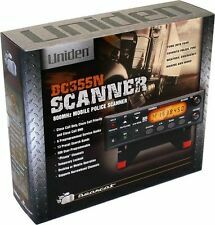 BC350A Scanner by UNIDEN BEARCAT. The BC350A is not just a scanner. With the BC350A, you can scan almost 1,000 channels. In addition, the. BC350A has 11 separate band search capabilities for even greater scanning. It's a great entry-level portable scanner but it will not work with 800 MHz, trunking and digital systems which are used in many areas of the country. 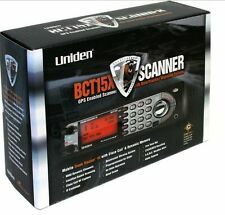 Uniden BC75XLT Handheld Analog Police Scanner. Compact Design - The Uniden BC75XLT is designed to be compact for added flexibility and portability. Whistler TRX-1 Handheld Digital Scanner Radio BRAND NEW! I will get back to you as soon as possible. The Whistler TRX-1 is multi-system adaptive digital trunking scanners with Motorola P25 Phase I, X2-TDMA, Phase II and DMR making it capable of monitoring the following unencrypted channels/systems: Conventional DMR (Entered as a DMR trunked system, Hytera XPT, MotoTRBO Capacity Plus, MotoTRBO Connect Plus, and MotoTRBO Linked Cap Plus systems. ). Automatic close call detection with tune into nearby transmission. Includes civilian aircraft and military aircraft Frequency Bands. Close call RF capture with Do-Not-Disturb. Display backlight. Lets you simply update the BCD536HP’s database, update firmware, and more easily manage favorite’s lists and other setting in your scanner. USB Connectivity. simply enter your zip code or city, and the BCD536HP selects the channels in use in your area. Model: SDS100. No scanner does better. The SDS100 is also the first scanner that allows you to decide what to display, where, and in what color. Custom fields put the information important to you right where you need it.